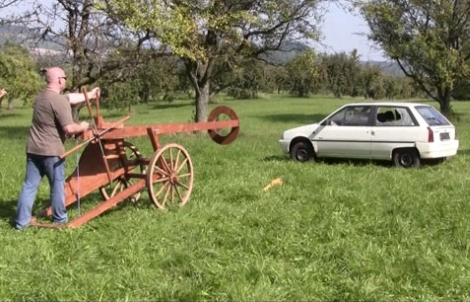 That guy just doesn’t quit building insane slingshots. If he’s not honing his machete slinging skills in preparation for the zombie apocalypse, he’s blowing out car windows with giant steel balls. The huge cannon you see above is modeled off a small slingshot he made a while back, which fired 8mm steel bearings. In its larger form, the slingshot is said to be ten times the size of it’s smaller brother, firing 80mm steel balls with incredible force. In the video below, [Jörg] and his friends cart the slingshot out to a huge empty field where they run it through its paces on several different objects. Their first shot flies about 220 yards into a high tension tower, after which the boys aim their sights on an old car. The power with which the slingshot fires is definitely impressive. With a few well-placed shots, the car is pretty much done for. Now that we’ve seen [Jörg] fire off saw blades, machetes, and giant ball bearings, we can’t wait to see what comes next! I only have one word for this… Awesome! His next slingshot will replace the first stage of the Sojuz rocket. As Einstein said: “WW3 will be fought with sticks and stones.” — did he have this guy in mind? It was actually the 4:th world war that he was saying we’ll use sticks and stones, we’ll probably destroy the world in the 3:rd one. This guy is crazy, it’s hard to believe you can fire such a heavy ball at that kind of speed with a slingshot. Awesome!This is what happens when you give men the resources and time to kill. You realised he’s German? Statistically we were a bit unfortunate when it comes to World Wars. This is a pretty awesome piece of German home engineering…I like! I think this is what the Romans called a scorpion. I thought it was the weight of the slingshot… didn’t he say at the beginning that it weighs 100kg? 220 is the weight of the slingshot, as in 220lb cannon shooting a steel ball. You also forget (though it doesn’t really apply, as others point out) that different steel alloys have different densities. And his name goes into my Rolodex of people to find in the Zombie Apocalypse, or the Robot Wars, which ever comes first. You guys are having way to much fun with rubber. This beats potato guns. I wonder where he gets the rubber bands?